For the past ten years, Moss Rock Festival invites artists from all over to exhibit their work in an outdoor Preserve located in the city of Hoover, Alabama. This makes the eleventh year and I, myself, have had the honor of exhibiting for the past five. I am always proud to show my work alongside my other artist friends and look forward to seeing them in our artist collective doing what we do best. This festival is somewhat different than others because you are right in the middle of a great nature preserve. It's a great time of year when the weather finally feels like fall (or supposed to) and you want to walk around nature alongside eco-friendly exhibits and artists. I love how the two work side by side together. It's become one of my favorite festivals that I participate in each year and this year will be wonderful! So instead of promoting myself (um, like you knew to come see me anyway, booth 453 by the entrance), I am highlighting some other artists that you should definitely check out (besides me of course). David is a long time artist friend, however, we go back longer to when Marilyn Wilson had her Art Gallery and Frame Shop where we worked together until she retired. He would build frames, I would sell art. Now we make and sell our art together and it's always good to see him at festivals instead of grumpy Monday mornings at the gallery. His vases are something that I've always loved since I've seen him work on them so many years ago, they are timeless pieces that work very well as a gift to anyone or for yourself to add to your own collection. I honestly think I have given all mine as gifts because I have yet to have my own! Maybe someday soon! Paul is this year's Moss Rock Festival Featured Artist. I've always been a fan of his whimsical paintings, including one of my favorites of the Piggly Wiggly Pig that he did one time. I'm so happy with his design this year for Moss Rock. As with every featured artist, it captures what the festival is about melding nature and art together into one. Go check out his other work and of course get one of those tshirts of this years design before you leave! I have known Susan since we first met at the Holiday Craft Bazaar years ago when she was first starting out as an artist. Since then, we have been friends and it's been a pleasure to see her grow in her artistry and her business. Her drawings are free flowing yet controlled and you just want to adopt and take all those animals home (including this Bowie bunny she did this year!). She was the featured artist for Moss Rock in 2013. I met Karen when she was exhibiting for her first time at Magic City Art Connection in 2013. That year, she definitely caused a commotion around our section and she had a reason to. I was floored by her work immediately. When you see it in person, you will be too. 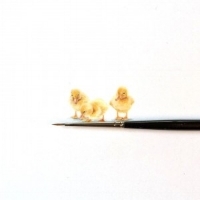 Her miniature tiny paintings are honestly one of God's blessings in the arts because I do not know how she does it. Anything you can think of, she has probably painted it in her collection as miniature. I am happy to own two of her prints, the Alabama Theatre and Chewbacca (they go together, right?). There will be a ticket to get in this year, and it's $7 each day for an adult or $10 for the weekend, kids get in FREE! Should be amazing weather so I will see you there!